At 7:20, the Darlings take their places, and the house lights dim. The show goes on. Hoboken, New Jersey, is a small, multicultural city just a quick train ride from Manhattan. Since arriving at Hoboken High School seven years ago, theatre teacher and Thespian troupe director Danielle Miller has produced a districtwide musical performed on Hoboken High School’s stage with students from the city’s high school, middle school, and four elementary schools. During her first year, Miller produced the customary fall play and spring musical with her students. Then she got a surprise call from the superintendent: Could she produce one more musical, cast with children of all ages selected from schools through out the entire school district? At the time, the concept was completely new to Miller. 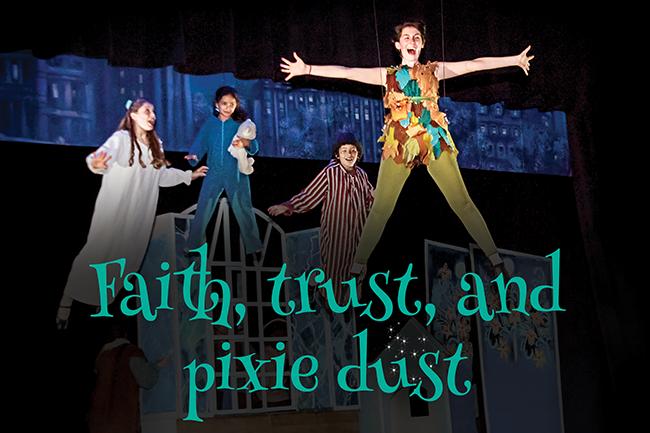 She had never heard of a high school theatre program producing a major musical like this. 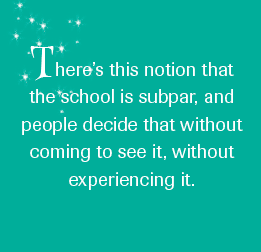 Even now, she says, she doesn’t know of another school in New Jersey that has a district-wide production. But she agreed, and without a lot of time to prepare, she quickly selected a show she knew well (You’re a Good Man, Charlie Brown) and dove in. “We had about 170 kids audition for Peter Pan this year, and we took 100,” says Miller, who also had another 20 students build and paint sets after school. “When we first started this, maybe there were 30 or 40 kids. Every kid that auditioned got to be in the show. It’s gotten so large now that the unfortunate aspect is we just can’t take every student.” Since then, Miller has steadily grown the district-wide musical program, directing productions of Seussical, Beauty and the Beast, and The Little Mermaid, among others. 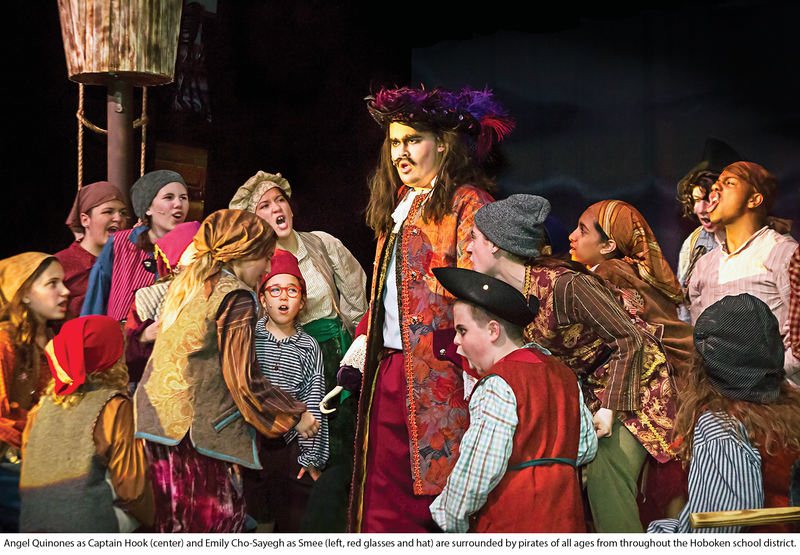 This year’s production of Peter Pan included cast members as young 5 and as old as 18. Students deliver their best work, while older students act as positive role models and leaders, and a strong base of about 50 parent volunteers support the production. According to Miller, audiences should leave stunned by the high quality of the production. 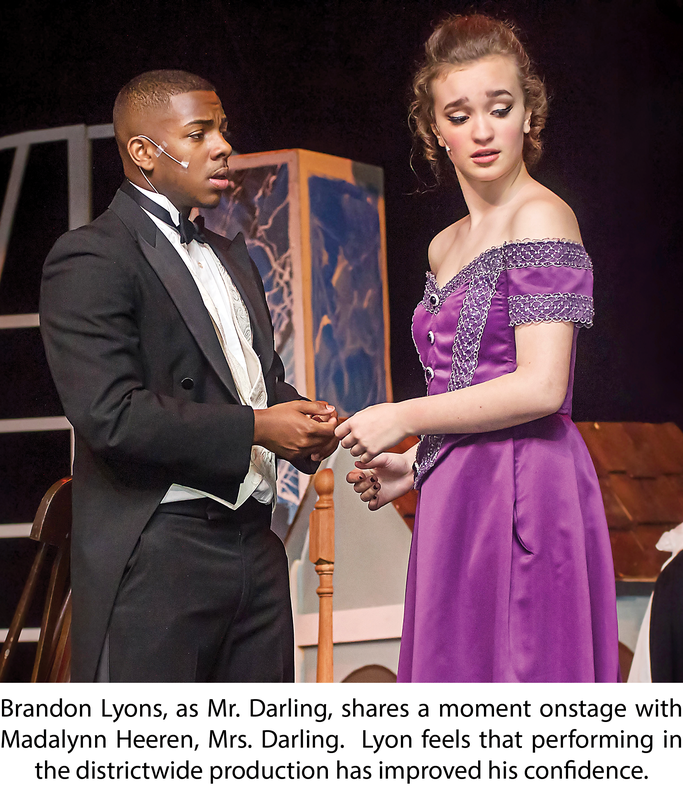 “The coolest thing about these shows is that, no matter how old you are or what grade you’re in, everyone’s equally valued,” says senior Brandon Lyons, who played Mr. Darling. Through theatre, Lyons says he has matured as a person, seeing himself overcome his shyness year after year to perform with confidence in front of a crowd — something he always wanted to do but never thought he could. Before auditioning for his first play, Hoboken’s districtwide production of The Little Mermaid three years ago, Lyons paced in and out of the theatre three times, almost too terrified to audition. But since landing the role of King Triton, he’s been hooked. Miller was enchanted by theatre at a young age, after her mother took her to see a production of Annie. A standout athlete in high school, she was named one of New Jersey’s top field hockey players her senior year. Although she excelled at sports, Miller knew deep down she wanted to pursue theatre, and she took a job after high school with a New York City casting director and acting coach. Now, in addition to the district-wide show, Miller teaches four to five different classes, directs a high school-only musical, and coaches her students on countless scenes and monologues. Her Thespian troupe spends many weekends on the road, traveling to events across New Jersey. Running a theatre program, Miller says, is like running a business: The more money that comes in, the more the program can grow. The group tries to do one fundraiser a month. The most difficult aspects of producing a district-wide musical have little to do with staging a musical, though. 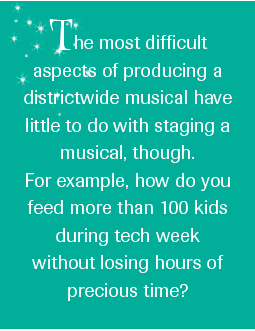 For example, how do you feed more than 100 kids during tech week without losing hours of precious time? How do you keep small children engaged during long rehearsals and help them make their entrances on time — and in the right costumes — during performances? Miller has cultivated an eager, committed group of parent volunteers to help run the district-wide show smoothly and successfully. During the show, as many as 30 parent volunteers sell concessions, tickets, and flowers. They help performers with hair, costumes, and make-up. 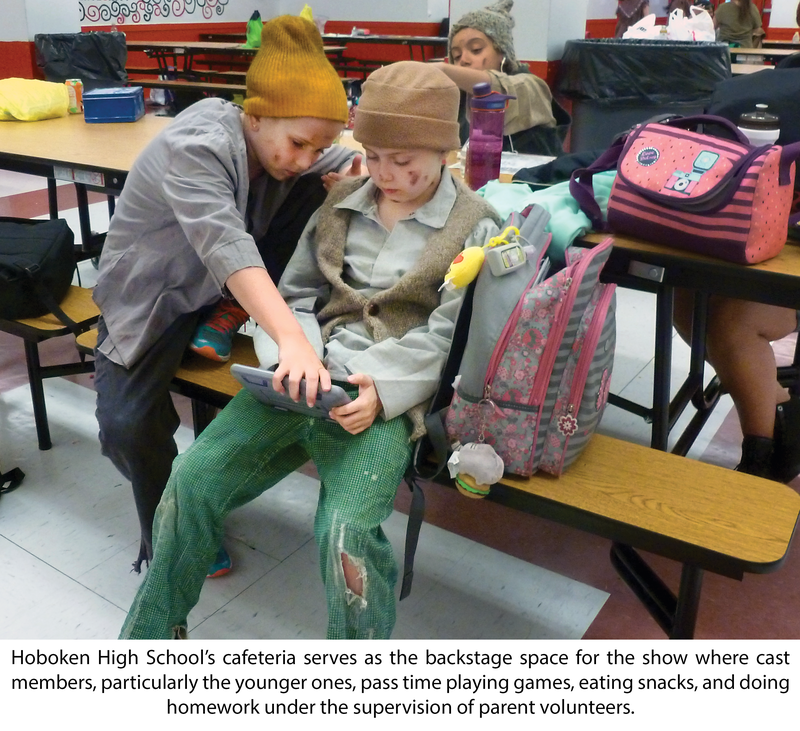 They keep a close eye on the youngest cast members in the cafeteria-turned-green room, which is divided into stations for different activities like playing board games, reading books, doing homework, eating snacks, and changing costumes. The tremendous parent support has been essential to the growth of the district-wide program. Hoboken High School is in the midst of a renaissance, and the district-wide show has gradually emerged as a key element of the school’s transformation. 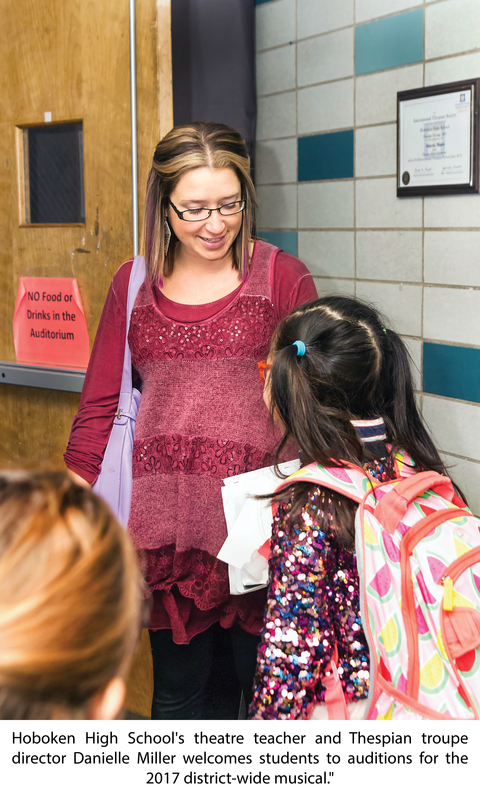 In the past, Principal Robin Piccapietra says, area parents with the means were more likely to send their children to a private or suburban school. Hoboken High School is a Title I school with a predominantly Hispanic student body, and many parents tried to avoid what they perceived to be a troubled, urban high school. Miller has steadily grown the districtwide musical, nearly tripling the number of students involved during the past five years and consistently selling out her 800-seat theatre, making the production one of Hoboken’s biggest events, an opportunity for students of all ages to share their passion for theatre with families from the community. “I’ve always found the musicals and the plays and the drama club productions to be wonderful for schools, but this districtwide show is different,” says Christine Johnson, Hoboken’s superintendent. After the show, people stand shoulder-to-shoulder in the lobby, snapping photos, handing out flowers, hugging. Cast members sign autographs, relishing their success following months of hard work and long nights. Even the pre-show stress of replacing Nana has vanished, replaced by the warmth and satisfaction that comes with performing a great show.